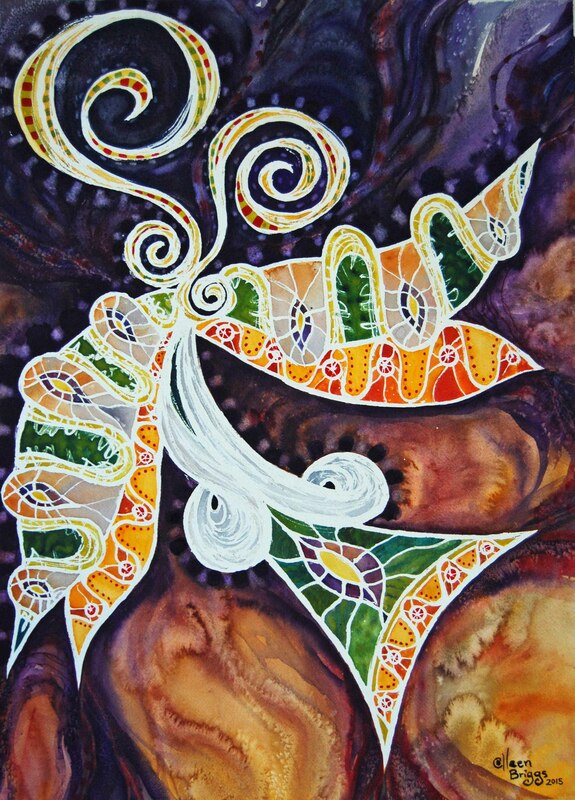 Dragonfly; 2015; 22″ x 30″; watercolor. I could still hear her crying in protest as I walked away, down a long, sun-laced hall, like a gangplank. The flap of my flip-flops echoed off tile floors, metal-frame windows, and cement walls. I passed an open doorway where older children huddled at a wooden table perched in an otherwise empty room. A sole caregiver spooned porridge into clanking metal bowls. She will never know that fate, I vowed. But for now, there was no way not to leave, my heart intentions a far cry from legal requirements that would allow me to carry her away. I will fulfill those legalities and return for her as quickly as possible, I added to my vow. At the end of the hall, I opened the door into equatorial sun, even as shadows fell deep, dark across my heart. Shock registered as my first emotion when I met Emma in 2002, lying listless in her crib on my first day of three weeks of volunteering in the orphanage. I picked up her long angular body and felt terrified she would die in my arms, languid and emaciated, as I sang and prayed over her for hours. I spent the bulk of every day with her, and I paid for her to receive treatment at a local hospital. As her health returned, her spirit blossomed. She lit up when she caught sight of me entering the ward. We spent hours together playing baby games and quietly snuggling. I fell in love again and again with each passing day. When I laid her in the crib that last time, she wailed in protest. Every fiber of my being pulled me towards her, and tore irrevocably as I walked away. Inexpressible tears slipped down my cheeks that night as we drove through the murky streets of Nairobi to the airport. On the flight home, I watched a strange and moody 2002 film, Dragonfly. Every twist and turn of plot expressed the yearnings of my own heart. A husband loses his wife in an international accident, but can’t let her go as she seems to be communicating from the beyond the barrier of death. He hopes she is telling him to come and find her, actually alive. But there is another surprise in store. I clung to hope that somehow God would lead me through this pain and back to Emma. At home, I saw dragonflies everywhere. At first I interpreted them as promises from God that He would restore Emma to me. When my husband quickly moved through the emotional process of deciding to pursue Emma’s adoption, I felt certain we would soon hold her in our arms. Less than a month after I returned home, just as my husband and I mutually decided to initiate adoption paperwork, I received a message from a friend in Kenya that Emma was gone. A woman claiming to be her mother came to the orphanage. The sisters did their best to verify the story, and were fearful about the situation; but in the end, they had to let Emma go. Much like the main character in Dragonfly, denied the closure of actually seeing his wife’s body, I struggled to process this shattering news. It was hard to believe she was truly gone without the physical evidence of seeing her empty crib, of searching the teeming slum streets for her face. Still, the dragonflies appeared everywhere. I desperately wanted them to mean I would find her again; but even apart from that longed-for happy ending, I clung to them as proof the story wasn’t over. Passing through the slums of Nairobi, I examined every child’s face. Somewhere, I knew, Emma roamed their labyrinths. Although I never found the gentle wise eyes, high cheekbones and narrow chin I longed for, I saw her everywhere. Beneath the sewage stench, the sodden rags, the grimy skin, there were no longer masses of children. For me, every child became Emma. Grief morphed into resolve. We began to till the soil of my friend’s prophetic word. With no sign of Emma in Kenya, our hearts turned towards adopting another little girl from the orphanage. The process required me to unexpectedly sojourn in Kenya for 7 ½ arduous months in 2005, and fallow dirt turned over into fertile black soil. Even as I, at long last, brought home our own little flower “Lily,” we planted a garden beyond my wildest hopes through relationships forged with dear Kenyan friends during that trying year of 2005 – Sanctuary of Hope, a home for 24 children who once suffered in the same conditions that led to Emma’s abandonment, began to grow in 2006. In some ways, I am still waiting for Emma. I often think of her, imagine what she looks like and how she is growing through the years. I pray and believe that somehow God is caring for her as lavishly as He cares for me. Somehow, someday, we will find one another again. The movie Dragonfly ends with these words, “It’s belief that gets us there.” I trust that my belief in the goodness of God will one day manifest in a reality beyond what I can ask or imagine. For now, I relish the laughter of Sanctuary of Hope children, a deposit of what is to come. Thank you for reading with your heart! I hope your painting process today brings you great joy Laura! Aw that’s so kind. Thank you! Your words and your colours both soothe and urge me on, all at once. Thank you, my friend! Wonderful story full of love from your own heart. Thanks for sharing this. Thank you for being such an encouragement to me Tony! Thank you Bonnie! Your recent update inspired me deeply, as you always do!